A disco inferno in space? Astronomers have been keeping an eye on an unusual star that unleashes a burst of light every 25 days, like an extremely slow pulsating disco ball. Similar pulsating bursts of light have been seen before, but this one, named LRLL 54361 is the most powerful beacon ever seen. Using the Spitzer and Hubble space telescopes, astronomers have solved the mystery of this star. It is actually two newly formed protostars in a binary system, doing a little disco dance of their own. And as they spin around each other on the smoky dance floor (actually a dense cloud of gas and dust), a blast of radiation is unleashed each time the stars get close to each other in their orbits. The effect seen by the telescopes is enhanced by an optical illusion called a light echo. NASA’s Spitzer and Hubble space telescopes have teamed up to uncover a mysterious infant star that behaves like a police strobe light. Credit: NASA, ESA, J. Muzerolle (STScI), E. Furlan (NOAO and Caltech), K. Flaherty (University of Arizona/Steward Observatory), Z. Balog (Max Planck Institute for Astronomy), and R. Gutermuth (University of Massachusetts, Amherst). The unusual thing is, while astronomers have seen this phenomenon before, called pulsed accretion, usually it is found in later stages of star birth – and not in such a young system or with such intensity and regularity. Astronomers say LRLL 54361 offers insights into the early stages of star formation when lots of gas and dust is being rapidly accreted to form a new binary star. “This protostar has such large brightness variations with a precise period that it is very difficult to explain,” said James Muzerolle of the Space Telescope Science Institute. His paper recently was published in the journal Nature. Discovered by NASA’s Spitzer Space Telescope, LRLL 54361 is a variable object inside the star-forming region IC 348, located 950 light-years from Earth. 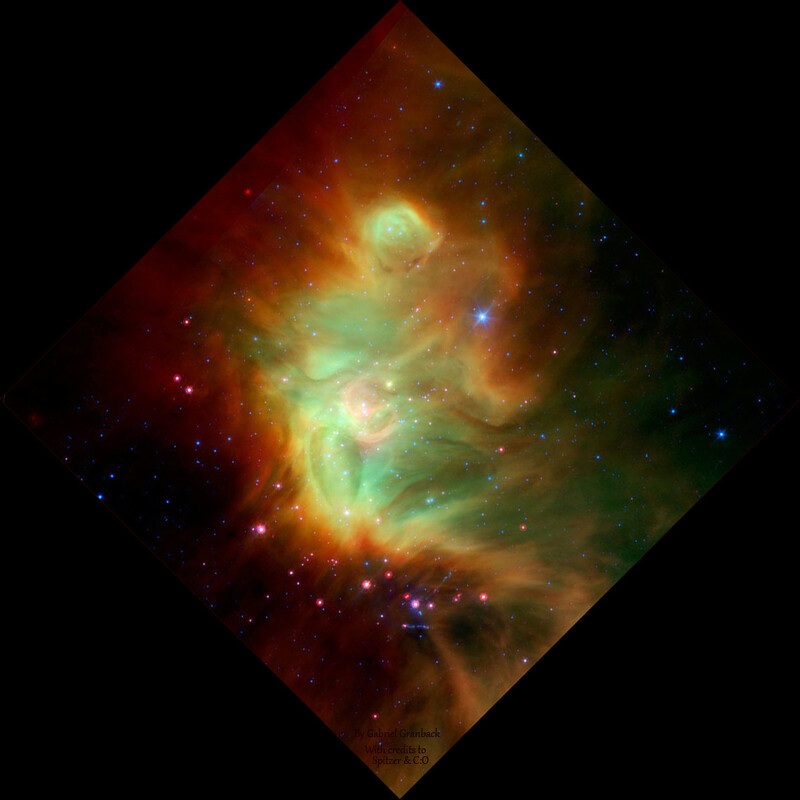 Data from Spitzer’s dust-piercing infrared cameras showed unusual outbursts in the brightness, occurring every 25.34 days, which is a very rare phenomenon. Based on statistical analysis, the two stars are estimated to be no more than a few hundred thousand years old. Astronomers used the Hubble Space Telescope to confirm the Spitzer observations and reveal the detailed stellar structure around LRLL 54361. Hubble observed two cavities above and below a dusty disk. The cavities are visible by tracing light scattered off their edges. They likely were blown out of the surrounding natal envelope of dust and gas by an outflow launched near the central stars. The disk and the envelope prevent the suspected binary star pair from being observed directly. By capturing multiple images over the course of one pulse event, the Hubble observations uncovered a spectacular movement of light away from the center of the system, the light echo optical illusion, where a sudden flash or burst of light is reflected off a source and arrives at the viewer some time after the initial flash. Muzerolle and his team hypothesized the pair of stars in the center of the dust cloud move around each other in a very eccentric orbit. As the stars approach each other, dust and gas are dragged from the inner edge of a surrounding disk. The material ultimately crashes onto one or both stars, which triggers a flash of light that illuminates the circumstellar dust. The system is rare because close binaries account for only a few percent of our galaxy’s stellar population. This is likely a brief, transitory phase in the birth of a star system. Muzerolle’s team next plans to continue monitoring LRLL 54361 using other facilities including the European Space Agency’s Herschel Space Telescope. The team hopes to eventually obtain more direct measurements of the binary star and its orbit. The paper is available on arXiv and is published at Nature. There are also source articles at NASA/Hubble, JPL/Spitzer, and ESA/Hubble. Really… a ‘disco’ light? Rrrrrr! Shake it up! Tay… I ‘poked’ around a bit but can’t seem to find co-ordinates or magnitude estimates for this oddity. I’ll assume it’s out of the reach of amateur telescopes anyway, but have made it a regular habit to check, ‘just in case’.. Be cool to chat up and point out the location of stuff like this at star parties? Maybe even at Frazer’s Virtual Star party? You said “disco Inferno”, but the first music to my mind was the opening riff to ABBA’s “Dancing Queen”. 950 light years is just down the road astronomically and the orbital dynamics should help gauge masses well enough to get a lot of detailed info on star formation. Is the blue star just above the center of the image have two dusty arms swirling around it?